Full color printed aluminum plate not with stickers. 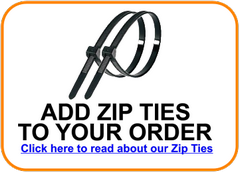 Easy to clean and UV protected. $15.00 each with 3.00 shipping .75 addtional. All UTVs and ATVs required to register for public use shall have a plate attached to the rear of the vehicle. 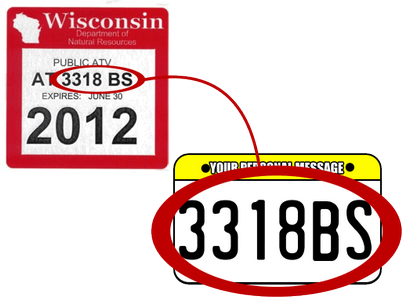 The plate must be made or purchased by the owner, and will not be provided by the DNR. The plate shall be a minimum of 4 inches in height and a minimum of 7 1/2 inches in width. The plate shall be white and shall display, in black letters/numbers, the four number and two letter registration ID number for the all-terrain vehicle or utility terrain vehicle issued by the Department. The registration ID numbers shall be a minimum of 1 1/2 inches in height, and a minimum of a 3/16 inch stroke (width). The person required to register the all-terrain vehicle or utility terrain vehicle. shall maintain the plate in legible condition. 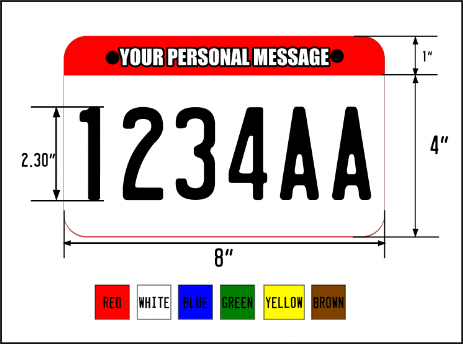 In addition to the plate, Public Use registration decals must be affixed to each side of the vehicle in a place that is forward of the operator and clearly visible. The minimum 4 inch by 7 ½ inch area must be white and must only contain the required registration ID characters. Plates may be larger than the minimum size listed and the area outside the minimum area may contain other graphics or colors. The registration ID numbers are located on the registration decals.